So, one of the things I love about me and Mike is how...I don't know how to put it...un-mooshy or un-traditionally romantic we are. Case in point - for Valentines day instead of going out to a fancy dinner or giving each other expensive gifts, we spent the whole day in our pajamas watching a Harry Potter marathon. Yes, Mike cooked a lovely meal that I showed all of you guys, but what you didn't know is that we ate that lobster tail in our pajamas, on the couch, while watching Harry Potter. Basically, we're nerdy, non-romantics in love. We've been talking about getting engaged since pretty soon into our relationship and life has just thrown us too many curve balls up unto this point. We've moved so many times, switched jobs so many times,and then bought this house, so it was just never the right time to plonk down a sack of cash for a ring and then plan a wedding. Mike, being a super nerd who works in a library, loves to research things and has been researching rings for ages. We've even tried a few on when we've been at the mall which always makes me nervous and nauseous...but in a good way! The other day, after having researched for so long and even picked out one he wanted to order online, Mike decided that I should come and help him pick out the ring because he really wanted me to get what I want. I agreed, saying that I would pick out two that I love and then leave and let him make the final choice so it would still be a surprise when he proposed. Just like when we bought this house...our best laid plans did not go as planned! We got to the store and no one was free to help us so we walked around and looked at every ring. There were so many, it was a little overwhelming, but there were two that really struck me that we decided I should try on. One that we were immediately drawn to was this gorgeous 1ct round solitaire sitting alone in the display that Mike and I couldn't believe was in our price range. So, the sales guy finally comes to help us and I try on the first one we saw and it was pretty, but I didn't really feel anything . 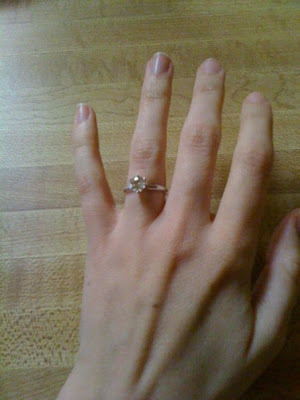 Then he takes out the solitaire and when I tried that on, we both were just blown away by how pretty it was. Our sales guy even let us take it outside and compare it to a more expensive 1ct and see if we could tell the difference. I'll admit...I had quite the urge to grab the thing and run when we were outside, but the sales guy was bigger then me so I didn't. We looked at other stuff and talked to the sales guy forever, but he let me hold onto the solitaire and I just kept putting it back on my finger and staring at it and Mike had that huge goober smile on his face that he gets when he's really happy so I knew this was the one. It took forever to pay and sign all the papers and I kept the ring on my hand the whole time. When our sales guy said that we could have it sized that day, but it wouldn't be ready until Tuesday, I got this look of panic on my face and asked if we could just take it home and bring it back later. Mike laughed and said that there's no way we're getting this ring off of my finger. Our sales guy finally pried the ring off of my clenched fist so he could put a sizer on it, (for such a chubby person, I cannot believe my ring size is a 4.25!! ), and Mike and I got a minute to calm down and walk around and look at watches for him. 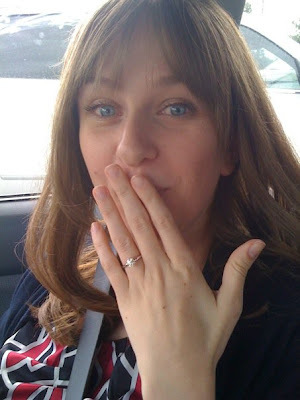 By the time the sales guy brought the ring back, I was a little less nervous and freaked out. He gave the ring to Mike and we walked out of the store, ready to finish the rest of our errands for the day. Mike didn't even put the ring back in the box. Right when we got outside the store he turned around to me and asked me if I wanted to marry him and put the ring on my finger. We had a big kiss and ran to the car excited and laughing and kissing over and over. We spent the rest of the day shopping and talking about the ring. Mike is just as excited about the ring as I am and keeps picking up my hand and staring at it. So...it might not be the most romantic or exciting proposal story. There were no roses or rings hidden in food, but it was perfectly us - we researched, we talked everything out, and we laughed. Me in the car right after Mike proposed. Elated/Surprised/Goober. Can't get a great picture of it, but this is my new shiny best friend. So when's the big day?? Wow! Lucky girl, I am so happy for you! It's easy to see how in love you are. I love the engagement story, I had a huge grin on my face the whole time I read it. Congrats!!! Miss ya.